Did you know there is another doobert? Home arrow_forwardFeatured Animal Rescue Transportarrow_forwardThere is another Doobert! Did you know there is another Doobert? It hasn’t always been like this, but that changed this weekend! 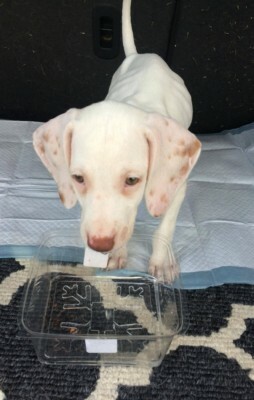 Meet Pup, also known as Doobert, an eight week old English Pointer, who weighs less than five pounds. This transport was a mix of Doobert volunteers and volunteers from Facebook. Myra, the transport coordinator with Transport4Rescues, sent out the run sheet before his transport, with Doobert in the subject line. One of the volunteers from Facebook mistakenly took this as Pup’s name. In mutual agreement, all of the volunteers and his new rescue thought Doobert was the perfect name for him! Doobert, came from an irresponsible breeder, and was emaciated and deaf. His ribs, spine and hip bones are visible with little body fat and little muscle mass. The breeder gave him no name, because he is deaf. The only name the transport coordinator received was Pup. Doobert was an owner surrender. 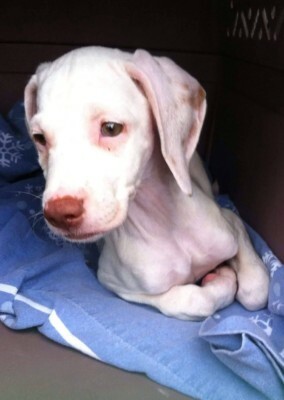 When they found out he was deaf, they were not comfortable keeping or placing him in a new home. Deaf Dogs Rock, which is an educational site that often get requests for help and refer the animal to rescues when needed, got a hold of Doobert, . Deaf Dogs Rock reached out to Green Dogs Unleashed to see if they would be able to help. Without hesitation, they said yes. Green Dogs Unleashed specializes in the training and placement of special needs dogs. This weekend he traveled over 1,000 miles from Savonburg, Kansas to Troy, Virginia to his new rescue. All of his volunteer drivers could not wait to meet him, and some even bought him little surprises like a lamb stuffed animal and a plush bone. Easy to say, everyone fell in love and will never forget Doobert. Thanks to Transport4Rescues and all of the volunteers, Doobert made it safe to his new foster and has a Chocolate Lab and Golden Lab foster brothers, a Chocolate Labradoodle foster sister and even met Cedric the cat too! Doobert started his journey with a piece of paper and a ziplock bag full of food, and finished with what the volunteers called “luggage”, and lots of love.